ISA-11:9 ...for the earth shall be full of the knowledge of the LORD, as the waters cover the sea. 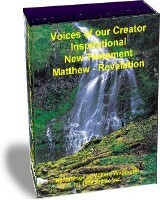 To help us to continue to build Bible Studies and Share Gods Word around the world 24 hours a day. 01. 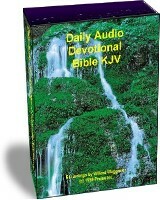 Devotionals: Daily Audio Devotional Bible KJV, DVD Video Format, 86 hours, 2 DVD Video Disks. 02. 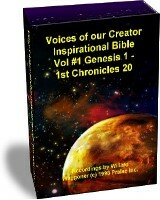 DVD Video: Inspirational Bible Complete Bible on 27 Disks with Nature Photos overlaid with KJV Text and Audio readings synchronized together. 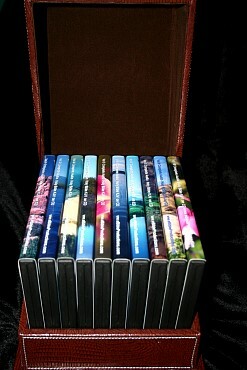 DVD Video Format, 80 hours, 17 DVD Video Disks. 04. 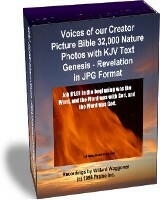 DVD Video: Inspirational Bible Complete New Testament on with Nature Photos overlaid with KJV Text and Audio readings synchronized together. 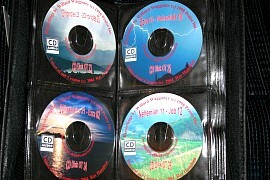 DVD Video Format, 17 hours, 6 DVD Video Disks. 05. 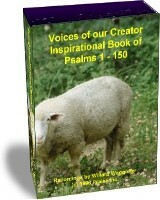 DVD Video: Inspirational Bible Book of Psalms with Nature Photos overlaid with KJV Text and Audio readings synchronized together. DVD Video Format, 2.7 hours, 2 DVD Video disks. 06. 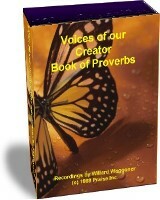 DVD Video: Inspirational Bible Book of Proverbs, Ecclesiastes, & Song of Solomon with Nature Photos overlaid with KJV Text and Audio readings synchronized together. DVD Video Format, 2.5 hours, 1 DVD Video disk. 07. 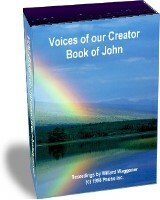 DVD Video: Inspirational Bible Book of John with Nature Photos overlaid with KJV Text and Audio readings synchronized together. DVD Video Format, 2.5 hours, 1 DVD Video disk. 08. 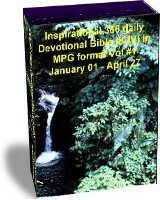 Devotional: Daily Audio Devotional Bible KJV, MP3 Format 128kbps on CD, 86 hours, 7 CD's for MP3 CD players. 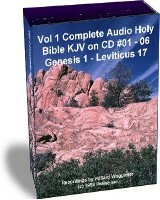 09.DVD Video: Complete Audio Holy Bible KJV on one DVD Video Disk, DVD Video Format, 75 hours, 1 DVD Video Disk. 10. 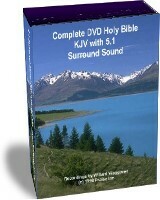 DVD Video: Complete Audio Holy Bible KJV in 5.1 Surround Sound format encoded at 224 kbps, DVD Video Format, 75 hours, 2 DVD Video Disks. 11. DVD Video: Ultra Surround Sound Complete Audio Holy Bible KJV in 5.1 Surround Sound format encoded at 448kbps, DVD Video Format, 75 hours, 4 DVD Video Disks. 12. 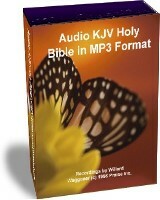 MP3 Format: Complete Audio Bible KJV, MP3 Format 128kbps, 75 hours, 1 DVD computer data disk. 13. 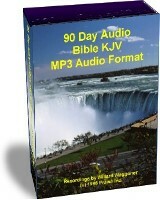 MP4/MP4 Format: Complete Audio Bible KJV, MP4 format, 75 hours, & Complete Daily Audio Devotions, MP4 format, 86 hours, Total time 160 hours, 1 DVD Computer data disk. 14. 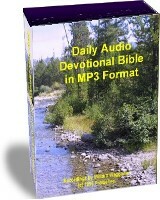 MP3 Format: Daily Audio Devotional Bible KJV, MP3 Format 128kbps, 86 Hours, 2 Computer data DVD disks. 15. 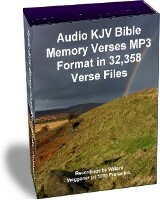 PC Computer: Complete Bible Screen Savers 32,000 photos with KJV Text and with full stereo background music, Screen saver exe format, 86 hours, 5 Computer data DVD disks. 16. PC Computer: Complete Bible Screen Savers 32,000 photos with KJV Text, Screen saver exe format, 86 hours, 3 Computer data DVD disks. 17. 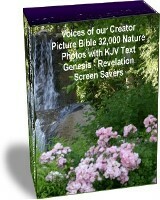 PC Computer: Complete Bible with Nature Photos overlaid with KJV Text and Audio readings synchronized together. Windows Media Video Format (WMV). 80 hours, 3 Computer Data DVD Disks. 18. 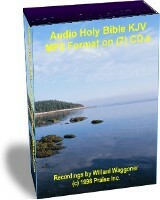 PC Computer: Ultimate Complete Holy Bible KJV Collection with Nature Photos overlaid with KJV Text and Audio readings synchronized together. Windows Media Video Format (WMV). & PC Computer: Complete Bible Screen Savers 32,000 photos with KJV Text, Screen saver exe format, Total of 6 Computer Data DVD Disks. Total Time 162 hours. 19. PC Computer: Inspirational Bible Picture Bible KJV with 32,000 Digital photos with KJV text overlaid, 1024 x 768 JPG Format, 3 Computer data DVD disks. 20. 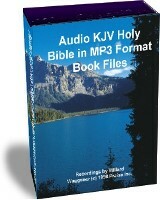 MP3: Complete Audio Bible KJV, MP3 Format 128kbps, 75 hours, 7 CD's disks for MP3 players or computers. 22b. 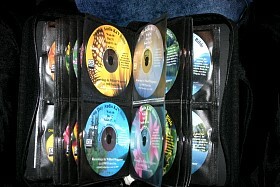 Audio CD: Complete Audio Bible KJV on 59 Audio CDs, 75 hours, 59 CD's for all audio CD players as a gift set with the 10 volume set in a Gift case that holds the 10 DVD Cases in a complete 10 volume set in DVD Cases with each case holding 6 CD's this set is in a DVD Storage box that holds all 10 DVD Cases. 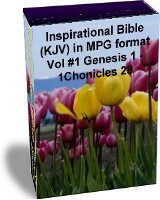 Beautiful Gift set that honors God's Word. 23. 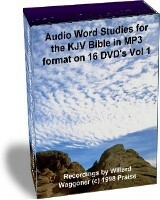 MP3 Format: Audio Word Studies from the KJV Bible in MP3 audio format on 16 DVD’s., 1400 hours, 16 DVD's data disks for computers. 24. 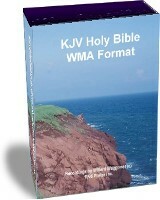 WMA format: WMA Bible on 1 DVD disk Chapter files KJV Audio Bible, 75 hours, 1 DVD Data disk. 25. 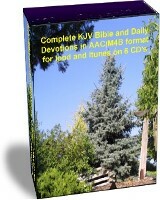 Devotionals: Daily Audio Devotional Bible KJV, Windows Media Video Format, 86 hours, 3 DVD Data Disks. 26. 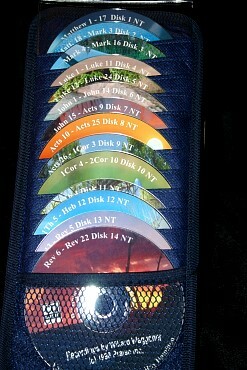 Devotionals: Daily Audio Devotional Bible KJV, DVD Video Player Format, 86 hours, 20 DVD Video Disks. 27. 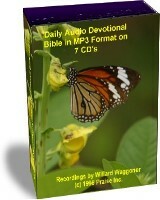 Devotionals: Daily Audio Devotional Bible KJV, CD Audio Format, 86 hours, 74 CDs Audio Disks. 30. 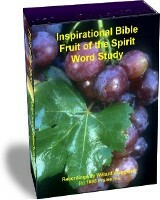 DVD Video: Inspirational Bible Word Studies on Fruit of the Spirit with Nature Photos overlaid with KJV Text and Audio readings synchronized together. DVD Video Format, 1 hours, 1 DVD Video disk. 31. 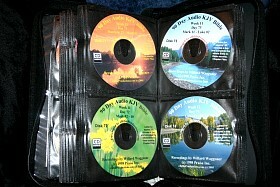 Complete Bible on 7 DVD Data Disks with Nature Photos overlaid with KJV Text and Audio readings synchronized together. 32. 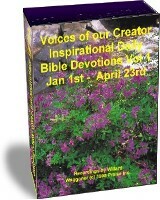 Devotionals: Daily Audio Devotional Bible KJV, DVD MP4 Format, 86 hours, 8 DVD Video Disks. 33. 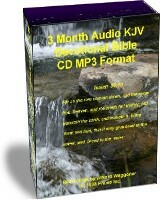 Devotionals: 3 Month Daily Audio Devotional Bible KJV, DVD Video Format, 75 hours, 1 DVD Video Disk. 34. 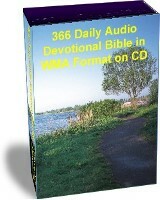 Devotionals: 3 Month Daily Audio Devotional Bible KJV, CD Data MP3 Format, 75 hours, 7 CD Disks. 35. 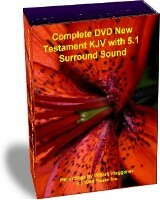 DVD Video: Complete DVD New Testament with 5.1 Surround Sound format encoded at 512kbps, DVD Video Format, 18 hours, 1 DVD Video Disks. 38. 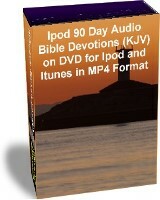 Devotionals: 90 Day Daily Audio Devotional Bible KJV, DVD Data MP3 Format, 75 hours, 1 DVD Disks. 39. 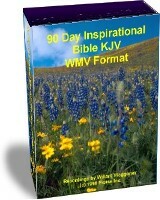 Complete 90 Day Bible with Nature Photos overlaid with KJV Text and Audio readings synchronized together WMV. 40. 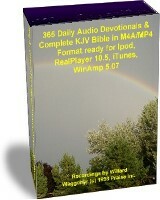 MP4/MP4 Format: Complete Audio Bible KJV, MP4 format, 75 hours, & Complete Daily Audio Devotions, MP4 format, 86 hours, Total time 160 hours, 6 CDs Computer data disk. 41. 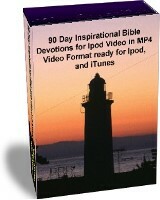 Devotionals: Ipod 90 day Daily Audio Devotional Bible KJV, DVD Video Format, 75 hours, 7 DVD Video Disks. 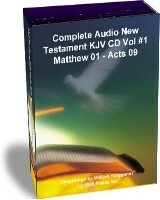 disks Chapter files KJV Audio Bible. 43. 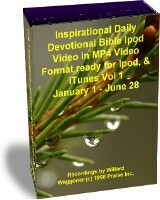 Devotionals: Ipod 90 Day Daily Audio Devotional Bible KJV, DVD Data MP4 Format, 75 hours, 1 DVD Disks. 44. 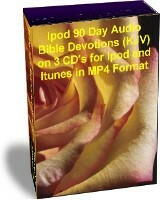 Devotionals: Ipod 90 Day Daily Audio Devotional Bible KJV, Data MP4 Format, 75 hours, 3 CD Disks. 45. 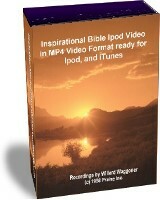 MP4/MP4 Format: Complete Audio Bible KJV, MP4 format, 75 hours, 1 CD Computer data disk. 46. 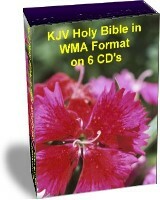 Devotional: Daily Audio Devotional Bible KJV, WMA Format on CD, 86 hours, 7 CD's for WMA CD players. 47. 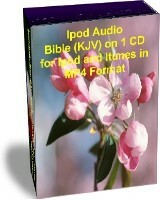 PC Computer: Complete Bible with Nature Photos overlaid with KJV Text and Audio readings synchronized together. MPG Video Format. 80 hours, 16 Computer Data DVD Disks. 48. 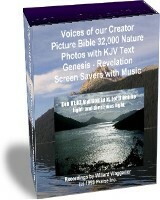 PC Computer: Complete Devotional Bible with Nature Photos overlaid with KJV Text and Audio readings synchronized together. MPG Video Format. 86 hours, 19 Computer Data DVD Disks. 49. 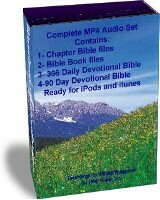 MP4/MP4 Format: Complete Audio Bible KJV, MP4 format, in chapter and book file formats 150 hours, & Complete 366 and 90 Daily Audio Devotions, MP4 format, 161 hours, Total time 311 hours, 1 DVD Computer data disk. 50. 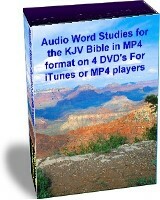 Audio Word Studies 1 from the KJV Bible in MP4 audio format on 4 DVD's. 51. 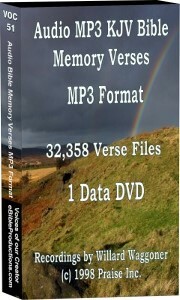 MP3 Format: Bible Memory MP3 files with31000 Verse files to choose from. Separate verse files. 75 hours, 1 DVD computer data disk.